Brian Robson Rankin was born in Newcastle Upon Tyne in 1941. He learned how to play the banjo and the piano in his childhood. But when he heard Buddy Holly, Rankin decided to learn the guitar. He had several buddies named Brian and so he got the nickname, “Hank”, to distinguish him from his namesakes. He liked the rockabilly singer, Marvin Rainwater, and his 1957 hit “Gonna Find Me A Bluebird”. Subsequently, Brian Rankin took the stage name Hank Marvin. Marvin and his boyhood chum, Bruce Welch, formed a band named The Railroaders in 1956. In early 1958 they released a song titled “Jean Dorothy” credited to The Five Chestnuts. Bruce and Hank moved to London later that year and briefly performed as The Geordie Boys. 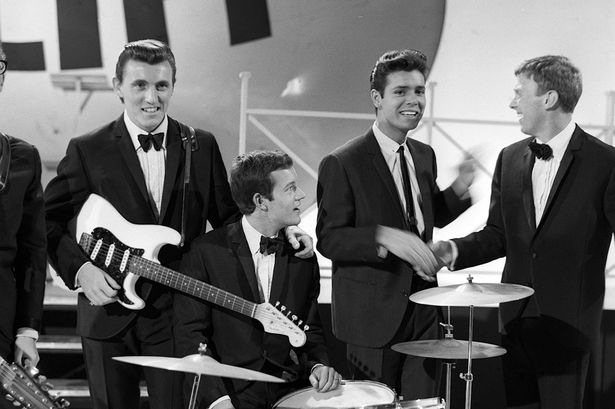 At the age of seventeen, Hank Marvin got a lucky break and was selected as guitarist in Cliff Richard’s backing band, The Drifters, as they were known in 1958. Fellow guitarist, Bruce Welch, also joined The Drifters. Bruce Welch was born in 1941 in Bognor Regis, a seaside resort 55 miles southwest of London. He formed The Railroaders while he was still fourteen (before he turned 15 on November 2, 1956). His friend, Hank Marvin was one of the other three bandmates. Another member of The Drifters was Terrance “Jet” Harris, who was born in North West London in 1939. It was Harris to suggested to Cliff Richard that the band change their name to The Shadows in order to avoid confusion with the American R&B group, The Drifters, who were had a string of hit records beginning with “Money Honey” in 1953 and most recently with “There Goes My Baby” in 1959. Another founding member of The Drifters was Tony Meehan who left The Shadows in 1961 to work as a session drummer with Joe Meek who was producing John Layton and later The Tornados. In 1960 The Shadows had a #1 hit on the UK charts with the instrumental “Apache”. The tune was successfully covered by Danish recording artist, Jørgen Ingmann, which climbed to #2 in the USA and Canada. Brian Lawrence Bennett replaced Tony Meehan as drummer for The Shadows. Bennett co-wrote “Summer Holiday” with Bennett wrote many instrumentals and songs for The Shadows, including “The Rise And Fall Of Flingle Bunt.” Bennett was born in London in 1940 and joined The Shadows in 1961. And After Jet Harris left the band there were several lineup changes and then John Rostill became the new bassist for the band. “Apache” began a string of 13 Top Ten hits on the UK singles chart for The Shadows. These include “Man Of Mystery” and “FBI” (#3 in France, #8 in New Zealand and #24 in Vancouver) and “The Frightened City” (#4 in Italy and #6 in South Africa). They had another #1 UK hit “Kon-Tiki” in 1961 (#3 in New Zealand and #4 in Australia and Ireland). In 1962 The Shadows had another #1 hit in the UK titled “Wonderful Land” (#1 in South Africa, New Zealand and Ireland; And #2 in Australia, The Netherlands and Norway – and #27 in Vancouver), while they had a #1 hit in Australia called “The Boys”. In 1962, The Shadows had second #1 hit in the UK in 1962 “Dance On” (#1 in Ireland, #2 in South Africa and Norway, #5 in Sweden and #26 in Vancouver). 1963 started out with another chart-topper titled “Foot Tapper”. It climbed to #1 in the UK, and made the Top Five in Australia, Ireland, New Zealand, Norway and South Africa. Their twelfth Top Ten hit on the UK charts was “Atlantis”. The single went #2 in the UK and New Zealand, and to the Top Five in Australia, New Zealand, Norway and Ireland. Including “The Boys” which peaked at #1 in Australia, but was not released in the UK, their next single, “Shindig”, was their thirteenth Top Ten hit internationally. Shindig means a noisy or merry dance or party, typically celebrating an occasion like a birthday or a graduation. The Oxford English Dictionary defines the word as an informal British English phrase meaning knees-up for a similar sort of party, taken from the 1938 music-hall song “Knees Up, Mother Brown“. 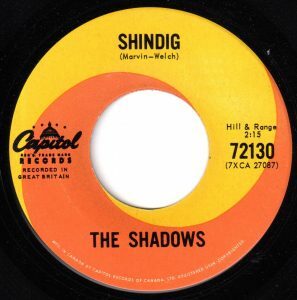 The Shadows instrumental recording of “Shindig” predated the ABC-TV series Shindig! that first aired in September 1964. The Shadows “Shindig” climbed to #6 in Vancouver and #5 in Edmonton. It was not a hit in the USA. Following their hit, The Shadows had three more Top Ten hits internationally into the mid-sixties. These were “Geronimo” (#28 in Vancouver), “Theme For Young Lovers”, “Don’t Make My Baby Blue” and “The Rise And Fall Of Flingle Bunt”. The latter was a #2 hit on C-FUN in Vancouver in August 1964. The Shadows also appeared with Cliff Richard in the films The Young Ones, Summer Holiday, Finders Keepers, Wonderful Life and Thunderbirds Are GO. In the 1960’s The Shadows were the fourth most popular recording act after The Beatles, Elvis Presley and Cliff Richard. One of the more successful songs Cliff Richard released in the mid-60’s was “Blue Turns To Grey“. The single, backed by The Shadows, climbed into the Top Ten in Vancouver. In 1969, after The Shadows split up, Hank Marvin had a #1 hit in New South Wales, Australia, titled “Sacha”. Among the hits Marvin co-wrote was Cliff Richard’s 1963 single “On The Beach”. In 1977, Hank Marvin was one of the co-writers for the Olivia Newton-John hit “Sam”. Hank Marvin has been credited as inspiring other aspiring guitar players including George Harrison, Eric Clapton, Peter Frampton, Pete Townsend of The Who, David Gilmore of Pink Floyd, Brian May of Queen, Mark Knopfler of Dire Straits, Ritchie Blackmore of Deep Purple, Steve Howe of Yes and Jeff Beck of The Yardbirds. Bruce Welch wrote a hit for Olivia Newton-John titled “Please Mr. Please”, which climbed into the Top Five in the USA and #1 in Canada in 1975. In 1989, Bruce Welch was a musical consultant for the Plymouth Theatre Royal production of Buddy – The Buddy Holly Story in London’s West End. In 1998 Welch produced Shadowmania, a one-day show comprising various Shadows tribute bands, with his own band, Bruce Welch’s Shadows, topping the bill. The event was so successful that it became an annual event Welch presented until 2012. In 2004 he was appointed to the OBE as an Officer of the Order of the British Empire. By the mid-70’s, Bennett became an arranger, conductor and record producer, composer for film and TV. Some of his scores include for the TV shows Dallas and Knotts Landing. In 2004, Brian Bennett was awarded an OBE at Buckingham Palace from Queen Elizabeth II. The other co-writer for “Summer Holiday” was Bruce Welch (born Bruce Cripps in London in 1941). Welch was a guitarist with The Shadows. Over his career he has written and arranged over 900 songs. These include “If Not For You” by Olivia Newton-John and Roger Whitaker’s 1986 album, The Genius Of Love. In 2004, Welch also received an OBE (Order of the British Empire). After The Shadows split John Rostill joined the backing band for Tom Jones. He also wrote several hits for Olivia Newton-John including “Let Me Be There” and “If You Love Me, Let Me Know”. He also co-wrote “Please Mr. Please”. In 1973 John Rostill committed suicide by taking an overdose of barbiturates. Cliff Richard, who The Shadows backed, went on to have more than twenty Top Ten hits in Vancouver. Nick McGrath, Hank Marvin: My Family Values, Guardian, June 13, 2014.